Exercises to help mental health practitioners at all levels of experience recognize gut feelings and produce deep therapeutic change. When immersed in therapy with a patient, clinicians are guided not only by conscious, explicit dialogues and intellectual investigation, but also by natural flows of emotion, energy, and body-based information—hunches, gut feelings, behavioral impulses. These natural flows are the foundation of clinical intuition, the right-brain means by which therapists perceive and respond to relational patterns and non-conscious signals during psychotherapy. 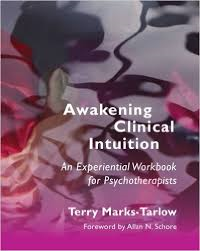 In Clinical Intuition in Psychotherapy, Terry Marks-Tarlow bridged art and science to explain the essential role of clinical intuition in transforming traumatized brains into healthy minds. Here, Marks-Tarlow walks through a series of exercises to help therapists at all levels of experience hone their sensitivity to their non-conscious resources and apply intuition effectively in therapy. 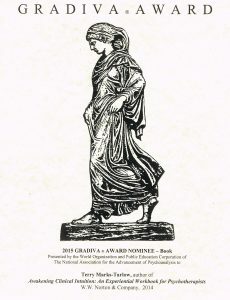 With exercises in breathing, mindfulness, meditation, play, perspective-building, and much more, Awakening Clinical Intuition is a practical workbook for eliminating mental clutter, getting in touch with right-brain, embodied responses to psychotherapy, and cultivating a unique, intuitive style. Features include client-ready applications and two hours of accompanying audio.